Better Than Take Out Beef and Broccoli, tender flank steak marinated and seared at a high temp, mixed with broccoli in a thick soy based gravy, like your favorite take out, but better! 1/3 Cup low sodium soy sauce definitely use low sodium here! Trim excess fat off the flank steak, cut into 1 1/2 to 2-inch slices against the grain. Mix the baking soda, sugar, cornstarch, soy sauce, water, and oil in a bowl and whisk together. Add cut steak to a gallon sized zip lock bag and pour in the marinade. Massage the marinade into the meat so all of it is covered. Place in fridge and let marinate for 1 hour. First, mix the "gravy" by placing the soy, stock, brown sugar, garlic, ginger, vinegar and flour into a small bowl, whisk to combine until there are no lumps of flour. Set aside. In a large, heavy bottom skillet, heat over high temp until very hot. Place 2 Tablespoons of the oil into skillet. Place broccoli into the oil, very carefully (make sure broccoli is COMPLETELY dry or you will get hot oil splattered all over). Saute broccoli for 3 minutes, stirring occasionally. Place broccoli on a plate and set aside. Keeping the heat over high heat, add in the remaining vegetable oil. VERY CAREFULLY add in the marinated steak and half of the sauce. Make sure beef covers the bottom of the pan and let sit for 1 minute to form a good sear. Stir and flatten to cover the bottom of the pan again, sear for another minute. Keep doing this until beef is nicely seared and cooked through, there is no pink left. the can take 8-10 minutes. Add in the broccoli and the remaining sauce. Toss to coat and let cook one additional minute. Serve with your favorite sides, enjoy! 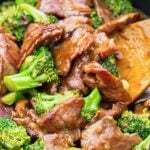 Better Than Take Out Beef and Broccoli Recipe found on https://thissillygirlskitchen.com/better-than-take-out-beef-and-broccoli/ *All nutritional information is approximate and may not be 100% accurate. Please consult a nutritionist for more specific information.